Can you fling your soul at out-of-reach spaces and then use it as a teleportation anchor? Yeah, we haven't quite mastered the technique yet either, but PS3 and PS4 owners will soon be able to live vicariously through an ape-ish creature that's got it down pat in Aaru's Awakening. Developer Lumenox Games' post on the PlayStation Blog states the puzzling platformer is set to pop into view on Sony's consoles sometime this summer. If you'd prefer to take this sort of experience on the go, Lumenox Games' Johann Ingi Gudjonsson stated that the team "doesn't see a reason not to port it over" when he responded to a reader's question about the potential for a Vita port. Aaru's Awakening started as a school project for the University of Reykjavík and was greenlit on Steam in April, with plans to launch for PC, Mac and Linux. Box art for a sequel to Homefront, THQ's 2011 shooter set in a North Korea-invaded United States, has popped up online.Now titled Homefront: The Revolution, artwork for the game's PlayStation 4 version was revealed by Swedish site FZ (thanks, OPM).Crytek's logo appears on the packaging, suggesting development continues at Crytek UK - as it was the last we heard of the game back in 2011.Back then, the title was set to be published by the now-defunct THQ. Crytek then bought the Homefront rights for $544k after THQ went under.Publisher Deep Silver is also listed, which picked up fellow THQ alumnus Saints Row. You meet Garneau several times in that game's modern-day section before he mysteriously disappears en route to a shareholders meeting in Chicago - the city where Watch Dogs is set.The assumption is that Garneau has been kidnapped, possibly by the modern-day Assassin's Brotherhood, but his fate is actually revealed in the Watch Dogs criminal convoy mission "Requiescat In Pace".In the mission you're tasked with hunting him down and taking him out. The character is still alive at the end of the encounter - but only barely. Scan him with your profiler device and his status reads "Targeted by the Brotherhood". "This guy's involved in some heavy s*** - patented genomes, genetic memory manipulation, sketchy pharmaceuticals," Aiden Pearce comments, referencing Garneau's employer Abstergo Industries. "All that, fuelled by an unhealthy dose of corporate corruption. "Another Watch Dogs Easter egg sees you spying on a father and son playing Assassin's Creed 2 - a game which in Ubisoft's universe exists as a product of Abstergo Entertainment. The two on-screen characters are seen watching a cut-scene, and Renaissance Assassin hunk Ezio Auditore's voice can be heard. And in Watch Dogs. These latest references return the nod to Watch Dogs included back in Assassin's Creed 4 last year. An email chain found on one of Abstergo Entertainment's computers revealed that the company had been contacted by Blume, the maker of Watch Dogs' CTOS surveillance technology. Does Watch Dogs deliver on its stunning E3 2012 reveal?Digital Foundry presents in-depth tech analysis of the finished game. But Assassin's Creed writer Darby McDevitt has said multiple times that the games' various nods to each other are simply fun references - and that the two franchises do not operate in a shared world such as Half-Life and Portal. "[Watch Dogs is its] own game in the Ubiverse," McDevitt wrote on Ubisoft's official AC Initiates forum. "We like to put Easter eggs in our games, but they are not literally connected." Green Lava Studios will release 2D platformer Fenix Rage on PS4 later this year, it has been confirmed. Fenix Rage will be the first console title for the Costa Rica-based studio. According to a spokesperson for the studio, the game's art style is inspired by the comic series Hellboy and cartoon SWAT Kats. Described as "aggravatingly addictive", the game will release this fall for PS4 (or spring in Australia). Asked in a PlayStation blog whether the platformer will make the jump to Vita, programmer Eduardo Ramirez said it is a possibility. "We are a very small team (only one programmer and that would be me), so we also have to manage our development time very closely. So right now, I'll just say we are open to the idea of Fenix Rage coming to the Vita." Sony released a comprehensive list of games expected to release for PS4 earlier this year, including an extensive range of indies. A new Vita bundle has been confirmed for PAL territories including the UK. The Action Mega Pack SKU includes five games – Injustice: Gods Among Us – Ultimate Edition, Batman: Arkham Origins Blackgate, PlayStation Allstars: Battle Royale, God of War: Chain of Olympus and Killzone: Liberation. It is available as part of either a PlayStation Vita PCH-2003 hardware bundle (which includes an 8GB memory card and download codes) for €199.99 or as a standalone pack (again, with codes and an 8GB card) for €39.99. UK prices have yet to be confirmed, although £179.99 for the console SKU seems likely. The former boss of Sony Computer Entertainment America has described the early success of PS4 as a ‘redemption’ for the challenges experienced by PS3. Tretton left Sony at the end of March and recently joined AI start-up Genotaur. "I did want to go out on top. I feel really good about where I left PlayStation with PS4,” he told Games Industry. “The most challenging time I think was establishing PlayStation 3 and establishing Blu-ray technology and the financial challenges that went along with the PS3. “But that's where PlayStation 4 was such a great redemption. Figuring everything out and making that platform such a success quite frankly contributed to me being more comfortable with getting on to the rest of my career. "I spent 19 years with Sony and enjoyed it very much, but my original plan was three years and it just continued to get extended as the company was successful and I was successful. It just got to the point, especially with the success of PlayStation 4, that I'd done just about everything I could for them and I really wanted an opportunity to be more of a free agent as opposed to being dedicated to one platform and one company. Tretton also complimented his former market rivals. "I think every company has their challenges but I have a tremendous amount of respect for Microsoft and Nintendo,” he added. “I think they both have tremendous resources and strengths and they've had their successes in the past and they'll have their successes in the future. “I think both companies will ultimately be around for a long time to come and will continue to have success in gaming. I've always said I think a rising tide lifts all boats, so if gaming is going to be healthy it needs as many healthy companies as possible. Over in the world of gaming discounts, Konami announced that its recentCastlevania: Lords of Shadow 2 has seen a universal price drop in Europe, discounting the Xbox 360, PlayStation 3, and PC versions to 29.99 Euro. Stateside, Amazon is offering a round of discounts on the console versions ofLords of Shadow 2, dropping the Xbox 360 and PlayStation 3 editions to $37.71 each. UPDATE: We will release 2 games - One for Europe/Australia, and one for North America. Even though we just released a VHBL for the PS Vita (JP store only), we will release yet another VHBL for the PS Vita firmware 3.15, which will be available in "multiple" regions. The game will NOT be available in the US-Store, but in most parts of europe and Australia. Martin Korth has updated his PlayStation emulator no$psx for Windows. a22i: added ".pack_chksum_xor8bit result" and ".pack_chksum_add8bit result"
Sony announced that it will entertain troops stationed at the Fort Riley military base in Kansas next week with a collection of playable PlayStation 4 games and a live concert from country star Brett Eldredge. The gaming-friendly Fort Riley, which hosts a dedicated video game area in its Warrior Zone recreation center, is the next scheduled stop on Sony's ongoing Road to Greatness tour. Sony's PlayStation truck will offer playable versions of upcoming PlayStation 4 games at Fort Riley on Tuesday and Wednesday next week, along with contests and giveaways for attendees. The event is open to the public, and begins at 11:00 a.m. on June 10 and 11. The next entry in Arc System Works' Guilty Gear franchise, dubbed Guilty Gear Xrd Sign, will allow PlayStation 3 players to throw down against those on PlayStation 4, according to the latest issue of Famitsu (courtesy Siliconeratranslation). Those unable to follow the labyrinthine naming structure Arc System Works uses for the Guilty Gear games should know that Guilty Gear Xrd Sign is the fifth official installment in the series, and ninth overall. 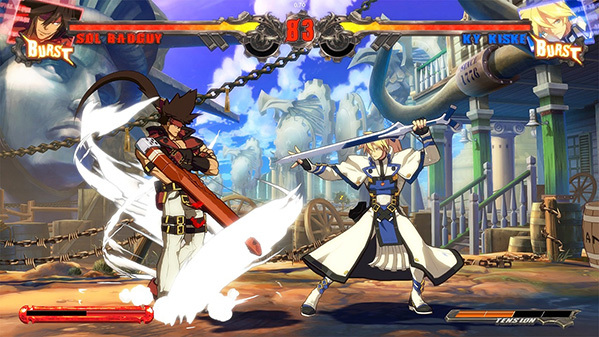 Unlike 2007's Guilty Gear 2: Overture, Guilty Gear Xrd Sign features three-dimensional characters duking it out on a 2D plane, not unlike Capcom's various Street Fighter 4iterations. Unfortunately for fans of Arc System Works' gorgeous 2D sprite animation, that's not the only trick Guilty Gear Xrd Sign borrows from Street Fighter 4, as the game will ditch hard-drawn graphics in favor of cel-shaded 3D models. Further information from this week's Famitsu report includes the comforting news that the PlayStation 4 incarnation of Guilty Gear Xrd Sign will run at 1080p resolution. Arc System Works also plans to add new, exclusive characters to the console version of Guilty Gear Xrd Sign, though there's no word on how many polygonal pugilists will join the fight. As we recently mentioned, Guilty Gear Xrd Sign is slated to hit both the PlayStation 3 and PlayStation 4 in North America at some point this Fall. Tecmo Koei announced that the fourth entry in Omega Force's Samurai Warriors series is coming to the PlayStation 4, PS3, and PS Vita in North America and Europe this fall. Boasting a roster of 55 playable characters inspired by figures from Japan's Warring States period, Samurai Warriors 4 adds several new modes and features to its hack-and-slash repertoire, including the quest-based Chronicle Mode and networked cooperative play across all supported platforms. The release also marks Samurai Warriors' return to Sony's platforms after a brief absence. Though the series traces its origins back to the PlayStation 2,Samurai Warriors 3 premiered in 2010 as a Nintendo Wii exclusive, and the follow-up Samurai Warriors: Chronicles was available only for the Nintendo 3DS. Further details regarding Samurai Warriors 4 will be revealed at E3 next week. And now the end is near, and so the PlayStation Portable faces the final curtain. The Sony handheld says sayonara to Japan later this month, when shipments to the country's stores will officially end. Sony announced the news today, noting it discontinued North American shipments back in January. The company told Associated Press the PSP is to continue in Europe until later this year, while The Verge adds there are no discontinuation plans yet for lines in Latin America and other Asian countries. 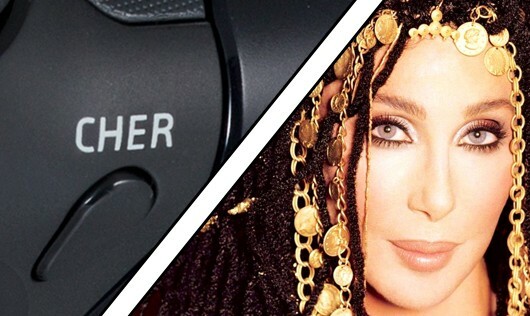 The PSP's farewell to its homeland comes nine and a half years after it launched there on December 12, 2004. While history will remember it as second-best to the uber-popular DS, the Sony handheld's numbers ain't to be sniffed at. As of March 2012 it had shipped 76.3 million units worldwide, a figure that's probably closer to 80 million now if not beyond. The PSP also brought us the sheer joy of Patapon as well as the resultant joy of Pata-puns, and for that alone it'll always pata-pata-pata-pon in our hearts. A month ago, EA and DICE launched something called a Community Test Environment for Battlefield 3. Here "passionate fans" could help DICE test new features and give feedback.The fruits of that labour have now begun to appear, as a netcode patch - making the game work better online - has rolled out on PC, PS3 and Xbox 360. It's coming later this week on PS4 and Xbox One.This is the first update developed in conjunction with the Community Test Environment, and would have been "difficult to pull off" (ooh err) without you.There's a long list of changes on the Battlelog website but the general idea - at least on PC, PS4 and Xbox One - is that the game will update more often in your immediate radius, apparently resulting in a "smoother, more 'correct' player experience". One thing Sony opening its doors to independent developers does is throw up the weird stuff. And One Way Trip is definitely weird.It's a game - a PS4 and Vita game - about death and what you'd do if you found out you only had six hours left to live. Oh, and you're poisoned, so you hallucinate. "To put it another way," wrote project leader Michael Frauenhofer on the PlayStation blog, "it's an atmospheric exploration of what it would be like to find out you and most everyone you love is about to die, and then have to process that while your limbs turn into cartoon dolphins. "Right then.There's a story mode that explores all this with a mixture of choice-making and procedural systems. The other people in the world live their lives and you can influence them or leave them be. The resulting outcomes can, because of this, be quite different.There's also another mode that has turn-based third-person shooting, where you and your carefully equipped squad try to survive against waves of weird enemies all to the beat of a bespoke hip-hop bop.One Way Trip is due 2015. Sony Computer Entertainment America has launched a role-playing game sale on the PlayStation Store. The discounts listed below, which offer up to 75 per cent off some games, are now available until Friday June 6 at 12pm Pacific. You'd expect an Ultra Street Fighter 4 arcade stick to support the PlayStation 3 - the game debuted there yesterday - yet Mad Catz's latest peripheral also features seemingly inexplicable support for the PlayStation 4. Once this news emerged, fans were quick to assume that this feature stands as a guarantee that Ultra Street Fighter 4 will soon appear on the PlayStation 4, though Mad Catz community manager Mark Julio was quick to crush those hopes. 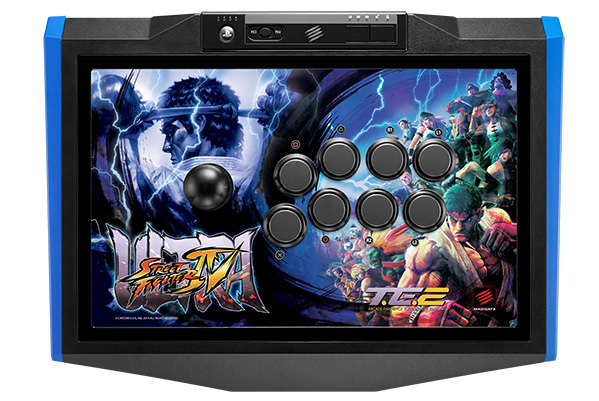 "Just because the stick is compatible with PS4 as well, does NOT mean there is PS4 USF4! We just implemented the feature as a benefit!" Julio tweeted. When asked why the similar Ultra Street Fighter 4 stick for the Xbox 360 does not also feature an Xbox One toggle, Julio's response was more succinct: "NoUSFIV on Xbox One!" Despite Julio's claims to the contrary, it seems unlikely that Ultra Street Fighter 4 will remain exclusive to the PlayStation 3 and Xbox 360. Capcom has a longhistory of issuing Street Fighter sequels to every platform under the sun, and the company needs to create a strong foothold on the new generation of consoles. For a growing segment of the gaming audience, there's no better way to do that than with a new, highly-anticipated Street Fighter entry. 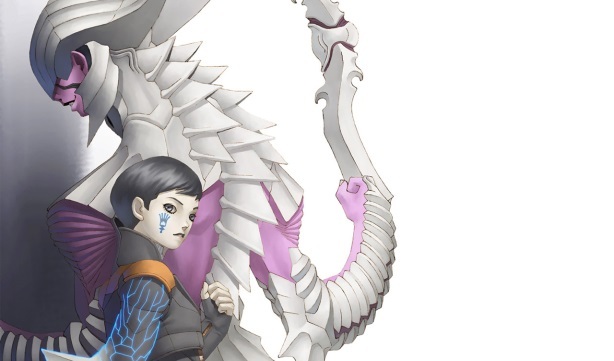 Want to know if Atlus' Shin Megami Tensei: Digital Devil Saga 2 is coming to stateside PS3s? The devil is in the details - specifically, the ESRB's details. A rating for a PS3 version of the game recently popped up on the ESRB's website, hinting at an eventual US release. Atlus has not officially announced a Digital Devil Saga 2 re-release for the US, though its prequel made an appearance on the PSN last month. War can get complicated - so can keeping track of all the involved pieces of a tabletop counterpart, such as the multi-decade warzone featured in Twilight Struggle. Convenience awaits though, as GMT Games has roared past its $50,000 base funding goal on Kickstarter. With the $151,496 collected at the time of this writing, Twilight Struggle will now reach PC, Mac, Linux, PS4, Vita, Xbox One, Android, iOS and Windows tablets. 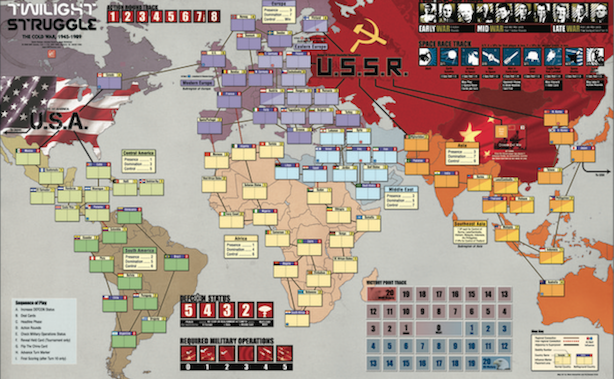 Twilight Struggle follows conflicts between the Soviet Union and the United States, letting two players attempt to spread the influence of either side throughout the world. Events from history come into play through Twilight Struggle's deck of cards, with each player attempting to earn points while also doing their best to keep a nuclear war from breaking out. A "What If?" expansion is also in development, which pitches alternate-dimension scenarios of previous historical events - Twilight Struggle's Kickstarter page offers an example of Western forces reaching Berlin first, or Churchill's Tories being re-elected in 1945. This extra helping of content is available for backers that pledge $15 or more with Kickstarter-exclusive artwork, but it will also be offered after the game's launch if you'd rather hold your money until the game is finished. Twilight Sturggle's Kickstarter page estimates the digital adaptation's completion around February 2015, but it's fair to consider the date was likely considered before the team crossed the stretch goals for console versions. 26 days remain in Twilight Struggle's Kickstarter campaign, with a $175,000 stretch goal left to fund an optional Space Race Track expansion, which an updateexplains will involve "changing the stakes in the race to the Moon and giving players a new way to mastermind great plays." When you get in an oddly-lengthy groove of being alive in Don't Starve, a survival run in its unsettling brand of wilderness can take a while. If it's the sort of adventure you'd prefer to tackle while on the go, you're in luck - developer Klei Entertainment is bringing the terrors found both in the base game and the Reign of Giants DLC expansion to Vita as Don't Starve: Giant Edition. While Klei Entertainment's Corey Rollins notes the team is "not sure of an exact release date yet," he confirms that the studio is implementing the Vita's touch features: "Navigation for menus, maps, items and crafting are all touch friendly, or you can use the classic button navigation." Rollins adds that Klei is "looking into options to let existing players upgrade to the Vita version," but since the base game was previously offered on PlayStation Plus and Giant Edition will include the DLC, Rollins concludes that it's "a bit tricker and we can't do cross-buy." Klei is also "working on the final steps" to bring Reign of Giants to PS4. 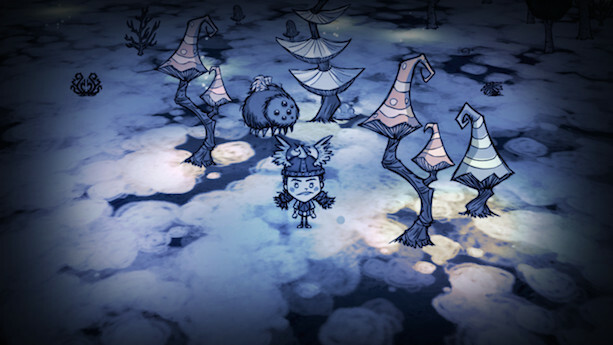 As far as the multiplayer expansion, Don't Starve Together, Rollins says that it's "very unlikely" to reach the Vita and that Klei is "still trying to figure out what's possible for PS4 and our PC playable Alpha won't be ready until late August(ish)." That sounds reasonable and all, but if we don't have moral support the next time we come across a nest of Don't Starve's terrifying spiders, we're not sure how well we'll hold up. There's a lot of (laser?) bullets packed into the ships of Gravity Crush Ultra, but developer Just Add Water expects to find space for all of them on the Vita by July. Serving as a beefed-up upgrade from the PS3 version that arrived in 2011,Ultra will blast apart foes at 60 fps with tweaked lighting and visual effects. JAW says that aside from boosts to visuals, a third playable ship debuts in Ultra, which allows for a total of three difficulty levels. The soundtrack has also been remixed, with minor tweaks cleaning up the menus and making mission notifications easier to keep track of. The original release's support for editing and sharing levels returns, in case you deplete Ultra's supply of winding, enemy-filled tunnels before you tire of blowing things to bits. PS4 owners can now buy games like Towerfall and Octodad: Dadliest Catch by stuffing their wallets full of moola from their PayPal accounts. Those looking to fund their digital purchases in this manner can do so on their PS4 consoles during the checkout process by selecting "Add Funds," then the PayPal option and picking the amount of dough to add to their wallet. Alternatively, players will be able to access the chunk of change in their PayPal accounts via their Sony Entertainment Network accounts, which are tied to their PSN wallets. Similar to the console method, eager buyers simply need to log in, select the "Account" tab, then the "Wallet" section, click "Add funds to Wallet," then follow the instructions to use PayPal as their funding option. PayPal funding, which was added to PS3 in November, is available to PS4 owners in the United States, Canada, Mexico, Chile and Argentina. EA has unveiled the new Mass Effect game being developed at BioWare. The fourth entry in the franchise, the game is being developed for "next-gen" hardware, likely the PS4 and Xbox One. In a behind-the-scenes glimpse at the new Mass Effect title, the developer said it wanted to offer fans new characters and new worlds to explore, appearing to hint the new entry will have little to do with the previous trilogy. One developer said BioWare was "trying to build a fictional world that feels real, is alive and constantly changing". One example of this was a new day-night cycle on planets they player explores. Few details were provided on the title. No release data or specific target platforms were given. In a teaser video shown before EA's E3 press conference, the studio revealed it had visited the Lucas Cultural Museum to capture images and data of the original models used in the films for their upcoming game. We think you'll agree that from the snippets of early in-game footage seen, they've done a bang up job. The video ended with the teaser 'See more in Spring 2015'. Hopefully, that's a hint to the release, not the next reveal. Final Fantasy Type-0 is heading west for Xbox One and PlayStation 4, Square Enix announced today. The PS4 version is confirmed for a North American launch, and Director Hajime Tabata notes both Xbox One and PS4 versions in . Xbox One and PS4 versions are confirmed in a European press release.Type-0 originally launched on PSP in Japan in 2011. Final Fantasy Agito, the free iOS and Android game set in the same world asType-0, is also on its way to North America and Europe. "The voice of our Western fans was instrumental in the development of Final Fantasy Type-0, and we're very excited to release this title soon," Director Hajime Tabata said in the release. "The new PlayStation 4 system and Xbox One platforms have really helped to re-envision this dynamic and turbulent world of Orience." Following the new date for the PlayStation Now beta in North America, Sony sent on a press release briefly discussing the price structures for its rental streaming program. According to Sony, the shortest periods will be "priced as low as $2.99," while most games - and presumably different rental options - will sit in the $3 to $20 range. Additionally, while Sony only noted a beta date for North America, the company added it'll continue to prepare the service for Europe and Japan. When Destiny first appears on the PlayStation 4 on September 9 it will be available both as a standalone game, and in a special bundle with an exclusive "glacier white" console. According to Andrew House, president of Sony Computer Entertainment Inc., this special version of the PlayStation 4 will feature a 500GB hard drive, a "glacier white" DualShock 4 controller, a copy of Destiny and a 30-day PlayStation Plus voucher. Notably lacking from House's revelation was a price point for the bundle. Update: Sony sent along further information on the bundle, which will cost $449 (439 euros). 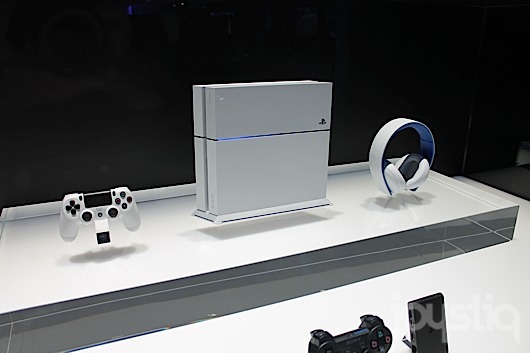 Alternatively, European buyers can pick up the glacier white PS4 alone for 399 euros. Glacier white and "urban camouflage" versions of the DualShock 4 controller will be available for $59 (59 euros). 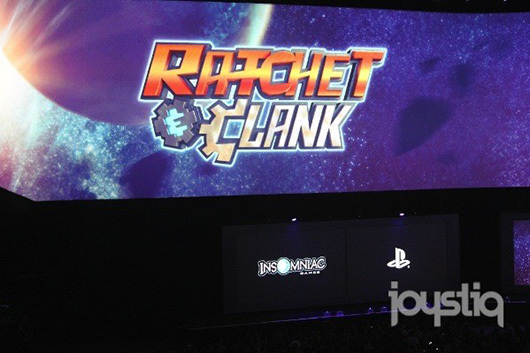 Alongside word that the Ratchet And Clank feature film will debut in the first part of 2015, Sony has revealed that a remake of the original Ratchet And Clankwill appear on the PlayStation 4 around the same time. No gameplay details, imagery or pricing information were revealed. PlayStation 3 hit The Last of Us completes its remastered journey onto PS4 next month. At Sony's E3 conference, the company announced a July 29 release date for the survival horror on Sony's newest system. The announcement wasn't the first The Last of Us-related news of the night. Earlier in the evening, Sony revealed the PS4 edition of Diablo 3: Ultimate Evil Edition will feature a dungeon based on Naughty Dog's game. Amid the unveiling of PlayStation TV for the West, Sony slipped in that Disney Infinity 2.0 is coming to the Vita and its TV-connecting variant. Disney's second game in its new plastic-stuffed series is due to hit various PlayStation, Nintendo and Xbox systems this fall. 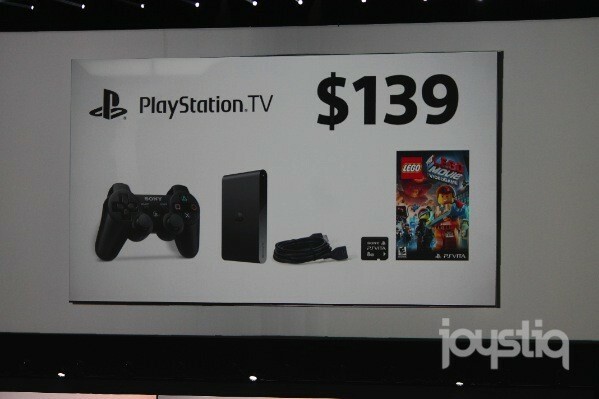 PS Vita TV is coming to the West, Sony announced at E3 2014. The device that allows you to play Vita games on your TV will cost $99 standalone, or $139 for a bundle including a DualShock 3, an 8GB memory card, an HDMI cable and a digital voucher for a copy of The Lego Movie Video Game. Users will have access to 1,000 games at launch, which will be ... actually, we don't know, sadly. 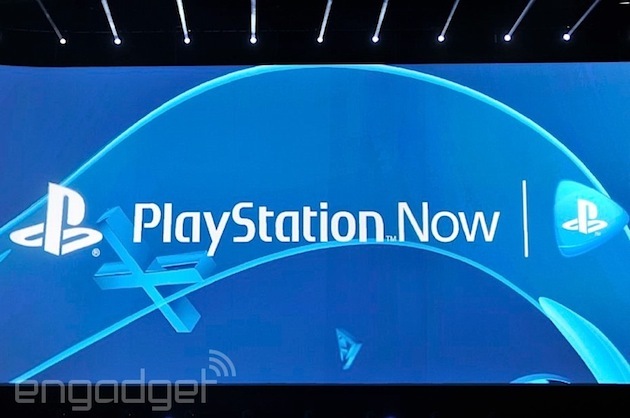 We do know, however, that it will connect to the PlayStation Now service, which enters public beta on July 31. Update: The PS Vita TV may be known by that nom de plume in Japan, but when it arrives stateside, it'll go by the slightly less-complicated-but-longer name "PlayStation TV," which is not to be confused with the PlayStation 3D Display. PlayStation Now, a service which will allow PlayStation 4 owners to stream playable PlayStation 3 games, will enter open beta in Canada and America on July 31. Sony revealed the beta release during it E3 press conference, though the publisher offered no further information on how players will gain access to the beta incarnation of PlayStation Now. Sony revealed today that more than 25 free-to-play games will hit the PlayStation 4 over the next 12 months. Announced titles include Kingdom Under Fire 2, Planetside 2, Onigiri, Loadout, and War Thunder. 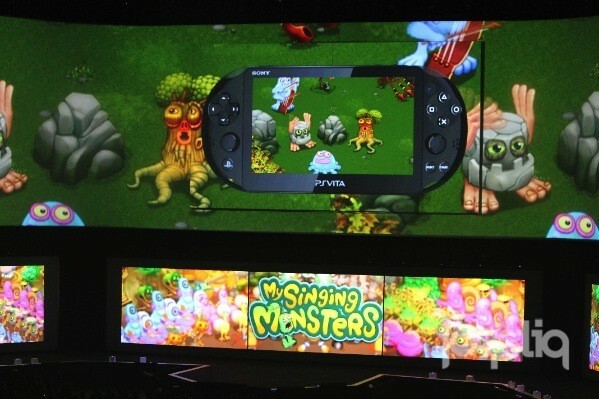 The PlayStation Vita will also receive a number of free-to-play games in the coming months, including Fat Princess: Piece of Cake, Big Fest, Destiny of Spirits, Reaper, My Singing Monsters, Guns Up!, and a new version of the early PlayStation 3 downloadable game Pain. Sony will add YouTube to its list of broadcast options via the DualShock 4's Share button on PS4, SCEA President Shawn Layden announced during the company's E3 2014 press conference today. Not only will players be able to upload clips directly to YouTube, but they will have the option to both live-stream gameplay and chat to the platform. Additionally, Sony will update the PS4's broadcasting options to allow spectators to further interact with streamers to a fairly strong extent: "You can help them, you can hurt them," Layden said of future griefing PS4 audiences. Want to SMASH it up as the Hulk in Disney Infinity 2.0? He and his fellow Avengers will appear in a special Collector's Edition that will be exclusive to PS4, Sony announced during their E3 2014 press conference. While Hulk and co. will be available for other platforms, grabbing the Collector's Edition will be the only way to play as the big green machine earlier than everyone else. Make your friends green with envy! The game, developed by Avalanche Studios, is set to hit store shelves and collectors' shelves alike this fall. Sony just announced LittleBigPlanet is making a return on PlayStation 4. As revealed at Sony's E3 conference, LittleBigPlanet 3 provides Sackboy with new pals in the form of Toggle and Swoop. The content creation series debuts on Sony's new system in November. A demonstration showed Sackboy and friends working through a level together, with Toggle shrinking to slip through small spaces and let others in from the other side of obstacles. Meanwhile, Swoop can fly and pick up Toggle to drop him onto higher platforms. Sony also announced that when LBP3 launches, all 8.7 million user levels from the first two games will be available to download. 8.7 million! That's a pretty sizable starter pack. PS4 and Project Morpheus game The Assembly has been announced.It's a creepy game about a secret collective of scientists, academics and engineers who believe morality is holding their work back.It's not clear what style of game it will be but there's a playable demo at E3.The developer is nDreams, a UK studio of 28 people. UPDATE: In addition to The Last of Us-themed Nephalem Rift, buyers of The Ultimate Evil Edition of Diablo 3 on PS3 and PS4 will get another treat: a Shadow of the Colossus-themed transmogrification set called Guise of the Colossi.Pictures of both additions are below. You must be able to connect to PSN to redeem the codes governing both.The Ultimate Evil Edition arrives 19th August. In addition to all the Reaper of Souls goodies it includes an Apprentice mode to buff lower-level friends in high-level groups; item-gifting options; and Nemesis Kills, so you can avenge your fallen friends. Sony dropped the "Vita" from PlayStation Vita TV's name to better reflect its market position in the West, Sony Computer Entertainment Europe president Jim Ryan has said. Ryan told CVG in an E3 interview that the new name "reflects the way that we anticipate the device will be used." "In Japan, where the handheld formats are very strong and vibrant, it was positioned initially as an alternative form of gaming console for Vita content," Ryan said. "In Europe, at least initially, the principal position will be to use PlayStation TV as a form of remote play for PS4. The user case is you're playing PS4 in the living room, someone else wants to use the TV, and you can go into your bedroom where your PS TV is and resume playing." 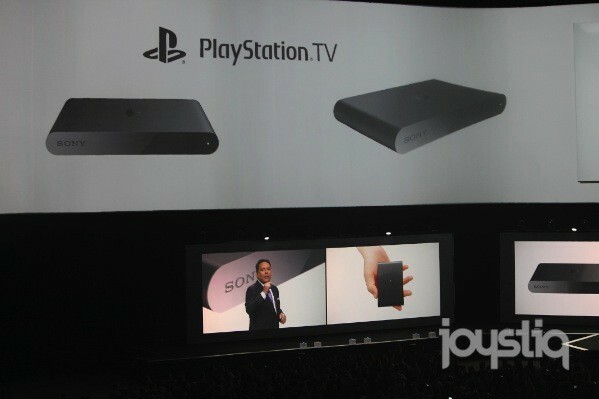 Ryan said that PlayStation TV will also function as a streaming center forPlayStation Now, which will enter open beta in North America on July 31. 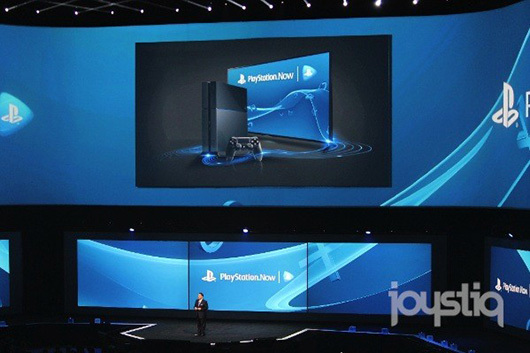 He noted that the question of PlayStation Now's launch in Europe is a "is a 'when', not an 'if'". 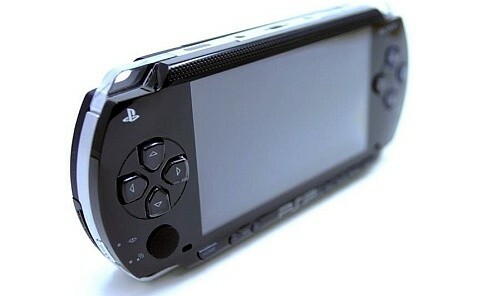 "Then, as a microconsole, you can enjoy PS Vita games, PSOne games, PSP games on it," Ryan added. "As a standalone console proposition it functions perfectly well there. You can see the Vita gaming bit is a subset is one of three positionings, so the name change makes it more coherent." The system is planned to launch for £84.99/€99/$99 in autumn 2014. Ryan told CVG in an E3 interview that the system's slate of games, fromThe Last of Us Remastered in July to Call of Duty: Advanced Warfareand Far Cry 4 in November, will have a powerful cumulative effect on system sales. "But if I had to pick one, it'd probably be Destiny," Ryan said. "We're partnered up with Activision on that. The intensity and depth that the two organisations are working at is something I've never seen before. Both really want to make this work in a really serious way. "The game is obviously multiformat so it will be out on Xbox One and 360, as it will be on PS3. But I think, certainly in our eyes, the main prize is the PS4 version of the game. We want to make that absolutely enormous." 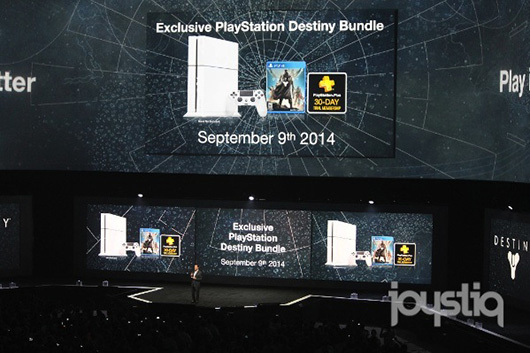 Sony plans to support Destiny with an exclusive white PS4 systembundled with the game at launch. PlayStation 3 and PlayStation 4 players will be the first to try Destiny's beta, which begins July 17. Check out our hands-on E3 preview with Destiny for more on Bungie's online shooter. Sony Computer Entertainment Europe president Jim Ryan told CVG in an E3 interview that the feature - which will allow Far Cry 4 owners to invite their friends to join them in co-op, whether those friends own the game or not - is "the first manifestation" of an existing idea for the console. "[I]t was something that was alluded to when we unveiled PS4 about a year ago," Ryan said. "Ubisoft have really embraced this and we're really intrigued to see how it goes." Ryan said the friend invites are "envisaged as a platform level feature", but they are waiting to see how they perform in Far Cry 4 before expanding efforts to secure the feature for more games. The SCEE executive said in the same interview that Sony plans to release a PS4/PS Vita bundle, but "packaging problems" are delaying its release. Be sure to check out all the rest of the news from Sony's E3 media briefing on Monday. Sony's plans to release a PS4/PS Vita hardware bundle have been "held up" by a problem with packaging design, according to SCEE president Jim Ryan. Speaking to CVG at E3, Ryan confirmed that the platform holder intends to release the bundle - as suggested by retail listings this month - but said that the company is currently trying to finalise the design of the packaging it will ship in. "Being a hardware manufacturer can be a very tedious thing," he said. "it's being held up by trying to get the bundle packaged in a way where drop tests work properly. We're just about there now. "When you develop a consumer electronics device you have to be able to drop it in a reasonable manner and it not break. Trying to find a configuration for a Vita and PS4 bundle that is not the size of a table has proved rather difficult. But I think we're there." Asked when the proposed Vita/PS4 bundle will finally make it to retail, Ryan said: "I'm guessing it will release at some point this year. If we're close, there's no reason for it not to." Last week a listing for the hardware bundle (pictured) appeared on Amazon France. According to the retail listing, the "Ultimate Player Edition" bundle will include a 500gb PS4, a Wi-Fi PS Vita slim, and a DualShock 4 controller for €579.99 in Europe: the same price as buying the consoles individually. Sony said in February that roughly one in three Vita owners also own a PS4, a figure which has likely only increased since PS4 sales surpassed 7 million in April. You may have heard that Sony is finally launching the PlayStation TV (or Vita TVas it was previously known) outside of Japan. We know that the mini-console will be priced at $99/€99 in North America and Europe respectively, but we were left in the dark over how much it would cost in the UK. Until now. 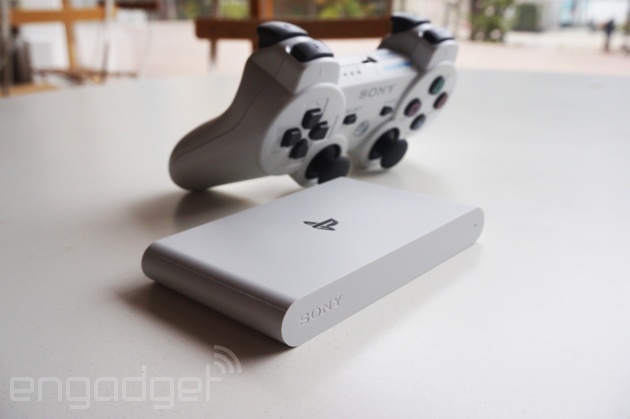 Eurogamer reports that when it arrives in the autumn, the PlayStation TV will retail for £84.99. That's a significant bump over the £60 (plus taxes) it would set you back if you went out to the US and bought one direct. To make matters worse, Sony won't offer UK customers the PS3 DualShock controller bundle like it does in the US and Asia. That said, it'll still mirror your PlayStation 4 screen and you'll still be able to play lots of Vita games, PlayStation games and stream video content, as well as music and video from Sony's own store. You knew a new Uncharted was coming to the PlayStation 4 -- it was inevitable, really. And tonight at E3, Sony just capped off its E3 press event with a teaser trailer of Naughty Dog's next title in the franchise: Uncharted 4: A Thief's End. 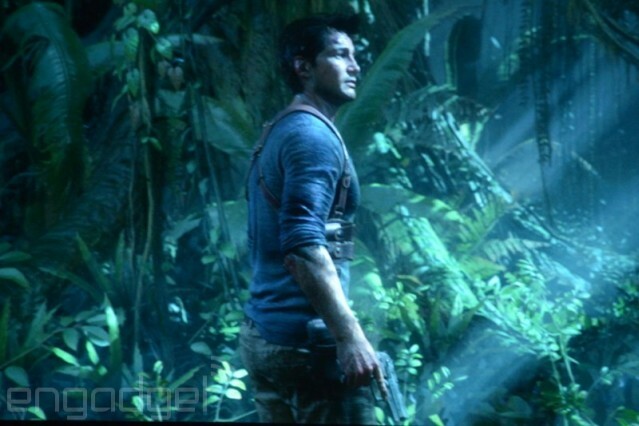 We didn't get much beyond a short scene of the series' hero Nathan Drake waking up bruised and walking through a jungle, but judging by the game's title, this could also be the last we ever see of Drake. Take note, the snippet of footage Sony showed was apparently captured directly from the PS4, so prepare for some absolutely gorgeous visuals. Expect to see the next-gen title arrive sometime in 2015. While its E3 presser has mostly been about specific games like Little Big Planet 3and Destiny, Sony has just given us a bit of good news about its game streaming service, PlayStation Now. Starting July 31st, all gamers in the US and Canada (excluding Hawaii and Alaska) will be able to join a full public beta of PS Now, assuming they have a PS4. PlayStation 3, Vita and "select" Sony TV owners (meaning you need the right TV model and a DualShock 3 controller to pair with it) will also be getting beta access shortly thereafter. Update: Sony has pushed out a press release with pricing information for some of the service's games. There will be over 100 titles available, all for rent at prices between $2.99 and $19.99 available for varying periods of time. Subscription-style access is still off in the future, as is a "pilot service" for compatible Bravia TVs, or access in Asia and Europe. PlayStation continues to outstrip Xbox at every turn this generation. Sony’s showcase had more surprises, more impressive game demos and far greater diversity than Microsoft’s briefing. Sony also had a wider range of things to talk about: there was PlayStation TV, Vita, PS Plus, Project Morpheus and the same kind of services Microsoft once focused on too much, but above all, the games therein simply looked better and more daring. This was a high pressure, high stakes showcase, and yet Sony’s executives were clearly brimming with the kind of easy confidence and good humour that comes with a significant lead in the console race, a superior games line-up and a richer ecosystem.Bungie’s Destiny led the way. A new hardware bundle complete with a white PS4 plus alpha and beta access for existing PS4 owners show the strength and extent of its partnership with Activision’s expensively-constructed next big thing. It’s an important deal for Sony, and not just because it feels like Xbox mainstay and Halo creator Bungie has somehow ‘switched sides’. It felt as if Sony was parking its tanks on Xbox’s lawn and declaring itself the ‘shooter box’ of choice this generation, countering Microsoft’s well-established Call Of Duty partnership with a wider variety of its own ‘better on PS4’ shooters. Later, a spectacular Far Cry 4 demo was backed up with the news that even PS4 owners who hadn’t bought the game could jump into the game’s co-op; Sony also had Battlefield Hardline in its armoury, with PS4 players able to sign up for its beta now.It all fed into what Andrew House talked about at the show’s outset, that his goal was to ensure that the biggest multiplatform games would look better and have exclusive content on PS4. Often, they’ll come to PlayStation first; there was a surprise remastering of Grim Fandango, for example, and all of Devolver Digital’s mouthwatering indie offerings – including Hotline Miami 2, Broforce and The Talos Principle – will debut on Sony consoles. Batman: Arkham Knight will have exclusive scarecrow missions on PS4, and those intending to pick up the newly ’next-gen’ GTAV will be able to transfer their online profile and progress to PS4 from PS3 and even Xbox 360. And let’s not forget No Man’s Sky, a game of stunning ambition which continues to dazzle with every new sighting. It was difficult to tell whether Hello Games’ Sean Murray wanted to cry or vomit (maybe both?) as he took the stage to confirm that it’ll arrive first on PlayStation. Lords of the Fallen, a methodical action RPG with more than a few similarities to a game whose name rhymes with Bark Voles (Snark Bowls? ), was one of E3 2013's quietest contenders. Amidst the many sequels, reboots, and other familiar faces accompanying PS4 and Xbox One's debuts, it was one of the only games for those boxes at the show that was not only original but felt fully formed. There are more than enough medieval fantasy games out there, but even with its somber story about a world where men toppled their own godFallen stood out. The guided demo through a crumbling castle and through its snowy courtyards, hosted by a clearly passionate executive producer Tomasz Gop, just sang. 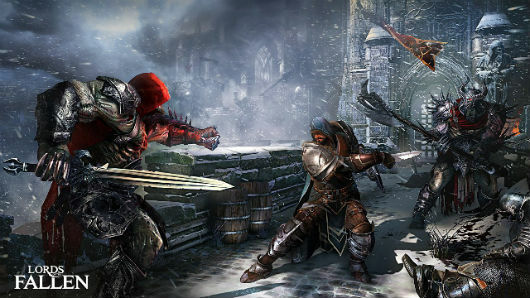 Here at E3 2014, Lords of the Fallen is fully playable on PlayStation 4, and while it felt fine to guide the demo's paladin through a gauntlet of vicious beasts, swinging a swift staff in steady combos, CI's game feels more unknowable now than it did last year. The $449 PlayStation 4 "glacier white" console will be available on September 9bundled with Destiny. We caught a glimpse of its porcelain visage on the E3showfloor and took a couple snaps of it. The aforementioned bundle will also be available in Europe for €439, along with a standalone console or €399. Apart from adding enemies from Naughty Dog's The Last of Us in randomized dungeons, Diablo 3 on PS4 will also feature exclusive pixels. Senior Producer on the console version of Diablo 3, Julia Humphreys, confirmed that the game will run at 900p on Xbox One; the PS4 version had previously been confirmed to run natively at 1080p. Both versions will run at 60 frames per second. "We're prioritizing frame rate," Humphreys said regarding the quality difference. Diablo 3: Ultimate Evil Edition is coming to the Xbox One, PS4, Xbox 360 and PS3 on August 19. Seeing Bloodborne behind closed doors, it was evidently clear this once beastly project has its roots in the developer's lauded Souls series. From Software may be approaching the PS4-exclusive action-RPG as an original property, but in that hands-off demo, differences and similarities were both patent. In short,Bloodborne felt both familiar and unfamiliar. For example, killing enemies produced a familiar sucking noise indicating something gained, but it wasn't shown if this was experience, souls, or whatever. There were glowing lights floating in their corpses, but it wasn't clear if these were items to be picked up. Entrances were engulfed in white light, enemies burst into view through barrels, the camera sat familiarly behind the hero - who's customizable, by the way - and the combat looked methodical and strategic. 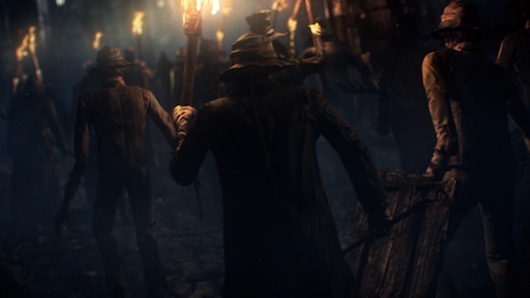 As director Hidetaka Miyazaki explained, the three major layers From wants in Bloodborne are exploration of the unknown, truly perilous combat, and a unique online concept. You could easily attribute those qualities to any Souls game. Minecraft won't finish a bridge to PS4, Vita and Xbox One until August, but a PlayStation Blog update lends a few more details about what we can expect from the port to Sony's latest home console. We were previously told that world sizes would be "a lot bigger" on newer consoles, but this update offers specifics: you'll have 36 times the space for flagship construction sites on the PS4 than you did on the PS3. You can consider the DualShock 4's touchpad as a new tool in your inventory as well, since 4J Studios is implementing optional support for its use with crafting or menu navigation. 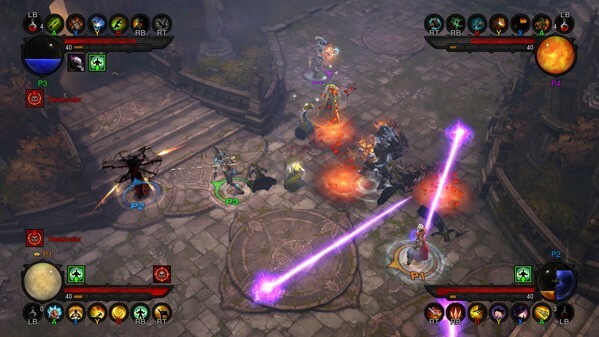 The PS4 version will offer eight-player online play, with a single PS4 being capable of hosting up to four players via splitscreen. Minecraft's PS4 debut will also be followed by "a bunch of Sony-specific DLC coming soon after release." As a reminder, saves will be transferable from the PS3 and Xbox 360, so you can keep flexing your creative architectural muscles without worrying about starting over. When the PS4 and Xbox One builds arrive in August, you'll be able to upgrade from digital versions for $4.99. Alternatively, PlayStation users can stick with the PS3 and get access to the Vita version for free. Mojang would like to offer discounts to those spinning disc-based versions ofMinecraft as well, but since the post notes that that's "proving a bit trickier to set up," we'll have to wait for more info to see whether that's possible. Research suggests that 31 per cent of PS4 owners had an Xbox 360 or Wii but not a PS3 in the last hardware generation. That’s according to PlayStation's American VP of marketing John Koller, who told Kotaku that the same research also suggested that 17 per cent of current PS4 owners didn’t own a last-gen console at all. “The person that we've picked up since launch primarily is someone we call the connoisseur, someone that loves, unequivocally, loves games," Koller explained. "They are the people who, when you walk in [to their home], there's no books on their book shelves. They're all game packages. They're the people who stood in line at midnight [for the console's launch]. They really are a fantastic consumer for us. They're a great part of the PlayStation nation. Koller also added that among early PS4 buyers are also a higher than expected number of "indulgers” who were described as “people that are traditionally a little bit more price-sensitive or down the funnel that have kind of bucked the trend as it were”. EA has released the full list of platforms you'll be able to play FIFA 15 on when it launches this September. There's the shiny PC, PlayStation 4 and Xbox One versions of course, the ones EA has been publicly demoing and which we've played.But there's also last-gen versions for PlayStation 3 and Xbox 360, handheld versions for 3DS and PlayStation Vita, and even a version for Wii.EA lists these other platforms as getting "a version of FIFA 15", rather than the full experience it has been showing off, and notes that "not all game features are available on all gaming platforms".As expected, there's no Wii U edition.Overall, the list of platforms is similar to last year, save for the inclusion of mobile platforms and a version for PlayStation 2 - for which FIFA had released every year since 2000.PS3 and Xbox 360 versions of FIFA 14 had a number of differences from their counterparts for newer consoles - gameplay-wise, as well as graphical. Last year's Vita version of the series came under fire, meanwhile, for being the second reskinned version of the FIFA title that launched with the handheld back in 2012.Boxart shows 3DS, Vita and Wii titles specifically labelled as a "Legacy Edition" of the game, but it's unclear what differences these titles will have. Bungie has extended Destiny's alpha testing period on PlayStation 4 to introduce some "dangerous" new experiments.Access to the alpha was due to conclude at 8am UK time this morning - but it is still accessible and plenty of users are still online, Eurogamer can confirm. "There's a rumor that the #Destiny Alpha might be extended to allow dangerous experiments," Bungie wrote on Twitter this morning. "Play beyond the official close at your own risk! "It's unknown what these new elements might be and how long servers will remain online. Let us know if you find anything!